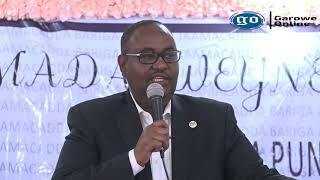 BOSASO, Puntland - Puntland President Abdiweli Mohamed Ali "Gaas" jetted off to the United Arab Emirates on Saturday a week after the Gulf country disbanded its training mission in Somalia, Garowe Online reports. President Ali's trip came after receiving an official invitation for a visit from the UAE government, a key ally in the fight against the terrorism and piracy in the region, sources at his office confirmed to GO. 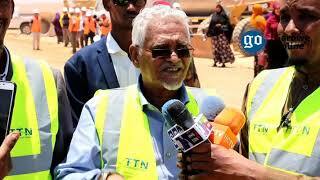 A private plane was sent to fly the president from the northeastern Bosaso port city. Last week, the State president has called on the United Arab Emirates to stay and continue to help Somalia, especially Puntland in training and military support and not shut its programme to pay and train PMPF soldiers. Speaking at a press conference in Bosaso, Ali said UAE has played an outstanding role in the rebuilding process of the National Army force of the country which was beset by decades of bloody conflict. The UAE has trained hundreds of troops in Somalia since 2014 as part of an agreement between the two countries in an effort to support the Federal government defeat Al-Shabab insurgents and secure the Horn of Africa country. The UAE halted its security operations in the country in response to the seizure of millions of dollars and the temporary holding of a UAE plane by Somali security forces at Mogadishu's Aden Abdulle Airport on 8th April. The Foreign Ministry of the United Arab Emirates has denounced the seizure of the money, which it said was destined to pay the Somali army and trainees. The relations between UAE and Somalia have been steadily declining since last year after the Somali Federal government took a neutral position in the dispute between Saudi-UAE led Arab alliance and Qatar. The Federal Member States opted to establish own relations with foreign countries to rebuild their infrastructure after accusing the Villa Somalia of holding back the International donors' assistance to Somalia in Mogadishu. Turkey and Qatar provide financial support and development projects to the Federal government which mostly ends up in Mogadishu, sparking row over the sharing of the foreign assistance allocated to Somalia. Pundits say the rift and mistrust is the result of lack of constitutional reform in Somalia as the previous government failed to complete the Provisional Constitution as well as the current administration is busy with political issues. The has led to the absence an inclusive clarification of the sharing scheme of the foreign support to the country and the definition of the political powers between Federal states and the central government. 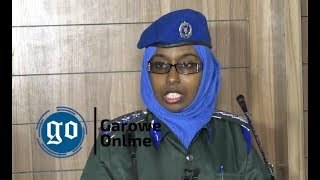 The United Arab Emirates has supported Puntland in the establishment of its Maritime Police Forces (PMPF) in 2011 under the President Abdirahman Farole administration. 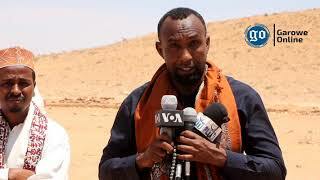 The forces played a key role in anti-piracy operations off Puntland coast, and now they are battling Al-Shabab and -pro-Islamic State militants in Galgala Mountains and other areas in Bari region. The UAE has suspended last week funds to pay the salaries of 2,407 soldiers in Mogadishu as result of the soaring diplomatic spat with the Federal Government of Somalia. 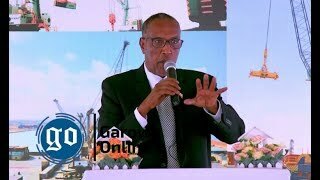 The Dubai-based DP World and P&O ports are in agreement to develop and manage Bosaso and Berbera ports with Puntland and the breakaway Somaliland despite rejection by the Somali government. Mogadishu seaport and Aden Abdulle International Airport are currently run by Turkish agencies following a deal with the central government. The deals have not yet been passed by the country's Federal Parliament.